The first edition of ARC+ St. Vincent came to an end last night at Hotel Alexandrina in St. Vincent, a very fitting venue for the finale of such a successful pioneering event. The rally has safely supported 66 participants and 15 boats from Las Palmas de Gran Canaria via the Cape Verdes and onto Blue Lagoon Marina. Since the doors opened to all ARC+ boats in Las Palmas at the beginning of November, participants have enjoyed a multitude of social events, informative seminars, breath-taking tours and of course some exciting offshore sailing which has made this unique sailing rally one to remember. The small group pioneering the St. Vincent route have got to know each other well over the past six weeks, forming great friendships and enjoying the close family-feel of the rally. Assembling before dinner, they gathered together with friends, family and dignitaries on the terrace by the hotel pool listening to live music and then just before the ceremony began, fire eaters turned up the heat to put on a great display. Crews were welcomed to the Prizegiving Ceremony by the honourable Cecil McKie, Minister for Tourism, Sport and Culture, and Bianca Porter, Chairperson of the Board of Tourism for St Vincent and the Grenadines, before the prizes were announced. It was the Multihull Division to be announce first, and with three catamarans taking part, it was inevitable that they would all visit the stage, although the final order was different from their awards for Leg 1 in Mindelo. White Pearl ultimately claimed the top spot, followed by Advantage 44 Tonia and third place was given to Blue Infinity who actually stopped in Barbados for a swim and BBQ on the way to St. Vincent! Definitely exhibiting the spirit that this was a rally not a race! It was not just awards for those sailing achievements presented during the evening. On arrival, each yacht was asked to nominate another in the fleet for the ‘Most Beautiful Yacht’ Competition, this year awarded to BellaRose, a Hallberg-Rassy 48. Sancta Anna won the fishing prize for landing a very large blue marlin during their trip and were awarded dinner at the Float Beach Bar within Blue Lagoon. Returning to the sailing prizes, it was Discovery 55 Amaman who led the ARC+ St. Vincent fleet into Blue Lagoon on 7th December at 6pm just as the sun set - certainly a fitting first arrival for the first edition of the route. Their crossing time of 12 days and 8 hours saw them awarded Line Honours having not used their engine during the crossing as well as placing 1st Overall in the Cruising Division. 2nd place was well deserved by Kelpie, and Rose Marie’s well-worn parasailor had propelled them to take 3rd place. Sail Be Happy sailed the shortest distance along the rhumb line of 2117.1 NM. As the fleet were led in by a yacht beginning with ‘A’, ARC+ St. Vincent Rally Control felt it only fitting that the final arrival beginning with ‘Z’ were also recognised. The crew of Zirocco, who arrived in to Blue Lagoon on 12th December, were awarded a tour of the beautiful island of St. Vincent. The final award of the evening was the Spirit of ARC+ St. Vincent, presented to the crew who have contributed significantly to the atmosphere of the rally. For this first edition, Sancta Anna’s crew from Poland announced as the winners for their ‘excessive fun and constant smiles’, generating enduring excitement and enthusiasm amongst their fellow ralliers. 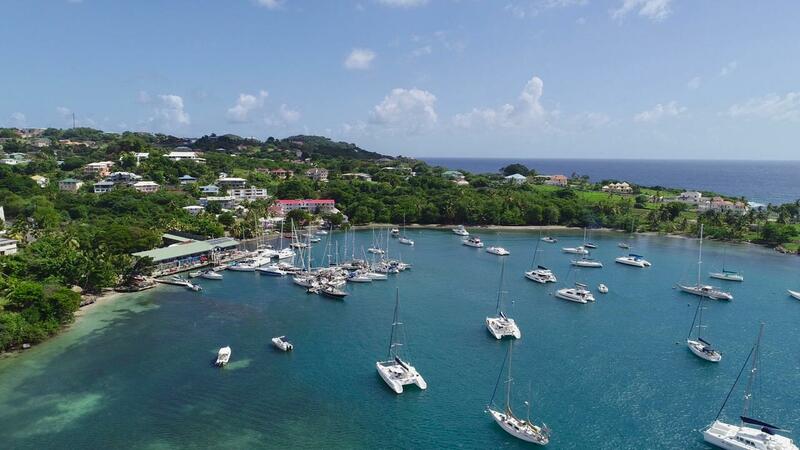 With the awards complete, a warm thanks was given to the St. Vincent and the Grenadines Tourism Authority, Blue Lagoon Marina and Hotel and the participants themselves for all supporting the inaugural ARC+ St. Vincent. Crews then made their way to the hotel restaurant for a fabulous Caribbean Christmas dinner, and thoroughly enjoyed the final function to round off the rally.